Sharat Sardana: a prodigiously gifted comedy writer. Sharat Sardana, who has died aged 40 of a streptococcal infection, was a prodigiously gifted comedy writer and producer who helped revolutionise the perception of Asians in Britain. With his writing partner, Richard Pinto, he created some of the most memorable characters and skits in Britain’s first ever Asian sketch show, Goodness Gracious Me, including Going for an English (satirising the British fondness for Indian food after a night at the pub), which was voted the sixth-funniest comedy sketch of all time by Channel 4 viewers in 2005. The show was originally commissioned by BBC Radio 4 in 1996 and transferred to television two years later. A pioneering comic voice, Sharat was unafraid to plunder personal experiences for comedy gain and based many of his GGM characters on family and friends. “The Coopers” (or Kapoors), Asian anglophiles who steadfastly refuse to acknowledge their ethnicity; “Mr Everything Comes from India”, whose singular catchphrase, “Indian”, applied to everyone and everything, from Superman to the British royal family; and “Check Please”, a misguided Lothario whose serial dinner dates ended with that phrase after the man’s offensive remarks cause his date to walk out, were all drawn from his acute observations of Britain’s multicultural melting pot and the comic possibilities therein. 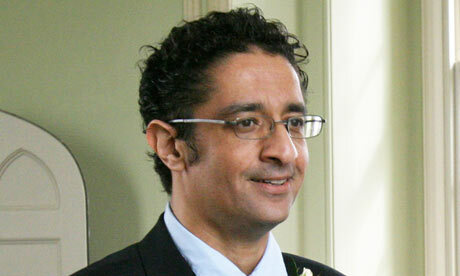 Sharat, the son of first-generation Indian immigrants (his mother was a GP and gynaecologist), was raised in Wanstead, east London. He attended Forest school, in Snaresbrook, where his anarchic humour did not always find favour with the authorities, but did lead him to Richard, a classmate. Their shared enthusiasm for irreverence bred a partnership determined to turn their passions into a career. After graduating in English from Queen Mary and Westfield, University of London, Sharat joined a BBC script editing scheme under the patronage of Anil Gupta, a budding comedy producer. Together, they amassed the writing and acting talent for Goodness Gracious Me, which ran first on radio and from 1998 to 2001 on television. Sharat and Richard contributed more than half the total output of sketches for the show before joining the independent production company Hat Trick. Their first solo venture was Small Potatoes for Channel 4. Having worked closely with them on this series and on GGM, I chose them as the natural partners to develop The Kumars at Number 42. The Sardana/Pinto combo was formidable. Sharat was the dashing, public face of the duo, the gobby one, who paced and prowled, throwing in surreal riffs and killer one-liners while Richard interrupted, shaped and refined and, most importantly, got it all down on paper. Writing with them was exhilarating. Sharat would conduct spectacular tangents and hilarious comic freefalls before Richard or I, our guilty pleasures assuaged, would point out that yet another deadline was looming. I envied his wit and encyclopaedic knowledge of pop culture but most of all his longstanding friendships. He had a small but perfectly formed group of people whom he had known since his school days that both enjoyed and were unconditionally supportive of his fame. Sharat was proud of his sartorial elegance and possessed an exuberance for the finer things in life. He would wax lyrical about restaurants, holiday destinations, the latest gadgets and flashy cars, though he was disappointed by those who were merely impressed by it all, wanting people instead to enjoy and share in his good fortune, without judgement. He was warm, compassionate and encouraging, attempting to find work for those who did not have it, but then providing a joyous distraction to those who couldn’t find it. Sharat and I became friends as soon as we started working together, recognising a shared vocabulary of references and routines akin to siblings. We were holiday companions, amateur musicians and confidants, sharing our highest and lowest moments, and we became part of the fabric of each other’s lives. In the last two years, his considerable talents could not find expression for the profound grief he felt at losing one of his oldest friends, Mark Denby, to cancer and then just a year ago, his mother, to the same disease. Sharat died in hospital, surrounded by family and close friends, and would have been genuinely surprised at how many people will feel his loss. He is survived by his father, Om.